This generous recipe gives and gives until it’s gone. 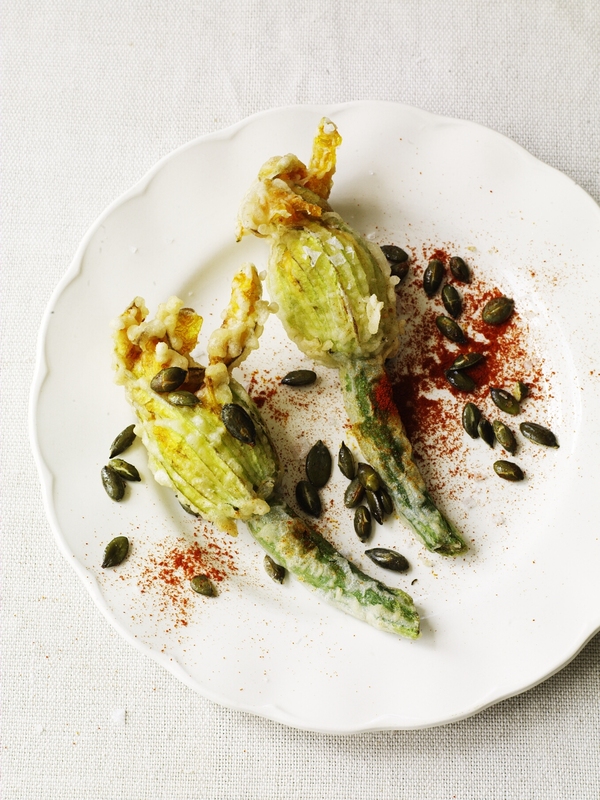 I like courgette flowers with the young courgettes still attached – it adds an extra texture when you come to eat them... with your fingers, your friends and some chilled fino. Place the fish in a bowl and scatter over the salt. Turn to coat, then cover and refrigerate for 5–6 hours. Wash the salt off the fish under a cold tap. Place the fish in a pan, cover with water and bring to a simmer over a medium heat. Cook for 4–5 minutes, or until the fish is just cooked through. Remove the fish from the pan and allow to cool. Pick over the fish, discarding any skin and bones, then flake the flesh. Put the potatoes in a pan with plenty of water. Bring to the boil and cook for 15–20 minutes, until tender. Drain and mash. Heat 5 tablespoons of olive oil in a small pan over a low heat. Add the garlic and sweat for a few minutes, until it just starts to colour at the edges. Remove and tip into a food processor along with the fish flakes. Pulse until you have a fairly smooth consistency. Tip the fish mixture out into a mixing bowl and beat in the mashed potato and the cream. Season with black pepper (it won’t need salt). Hold the base of one courgette flower and gently fold down the petals over your index finger and thumb. Using a teaspoon, spoon some of the salt-cod mixture into the flower, then press down to remove any air pockets. Fold the petals back into place. Repeat with the remaining flowers. In a small bowl, combine the pumpkin seeds with the remaining olive oil, and season well. To make the batter, combine the flour, cornflour and salt, then whisk in about 150ml (5fl oz) water until well-combined. at a time, lower them quickly into the hot oil. Don’t overcrowd the pan. Fry for about 2 minutes, until lightly golden and crisp, then drain on kitchen paper. Repeat as necessary. To serve, place 2 or 3 flowers on a plate. Scatter over the pumpkin seeds and finish with a sprinkling of smoked paprika.